If you’re anything like me, you wait until the last possible minute to do your holiday shopping. No, it’s not the smartest thing to do, but that’s life. 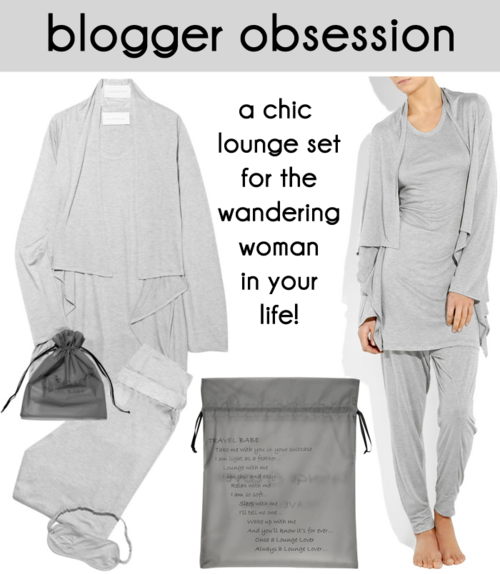 If you have a hard time coming up with unique ideas for what to get the women in your life, consider this travel lounge set by Lounge Lover. Anyone who does a lot of vacationing or even traveling for work, would appreciate the super soft cashmere-blend pieces in this pack. Just stuff them all in the little bag for an easy lounge/sleep getup to take on those short weekend getaways or on a trip where you have to pack light. It will make a great holiday gift and will prove itself very useful for her. Get this luscious lounge set here!